As part of my partnership with GE, I received coupons for my GE lightbulbs. But as always, all opinions expressed here about my experience with GE Lighting are my own. Back in November I wrote a post where I shared my desire to convert our home lighting over to the more energy-efficient compact fluorescent bulbs. But I was hesitant to jump in with both feet because our earlier attempts to do this have been met with frustration- bulbs that took forever to “warm up”, bulbs that flickered like a bad disco light, and bulbs that just weren't bright enough. 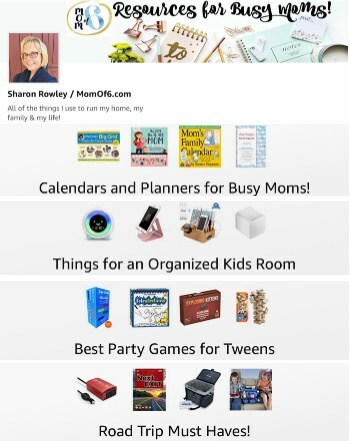 But I was willing to give CFL bulbs another try…. I decided to embark upon a bit of a home project with my kids. 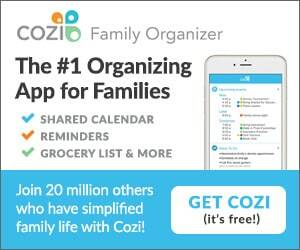 I wanted to see if changing out our light bulbs in one specific room would really save us money over time. And I wanted to factor in all of the costs…. 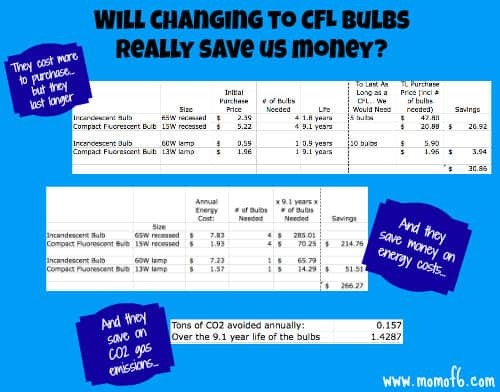 because the initial purchase price on CFL light bulbs are certainly quite a bit more expensive than a traditional bulb… so when I take into account both purchase cost as well as usage cost- do we come out ahead? And does it really lead to improving the planet? We selected my home office as our room to “experiment with”- a space that uses 4 recessed lights in the ceiling plus a desk lamp. 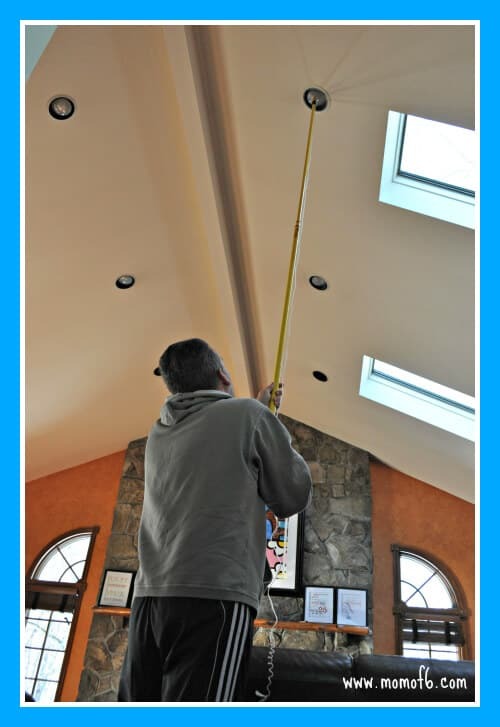 In just this one room, changing out 5 light bulbs from traditional bulbs to CFLs…. I can save nearly $30/ year in electricity costs. And over the nine-year life span of the light bulb, my total savings in saved replacement bulb costs and energy cost is nearly $300! And this is just one room. 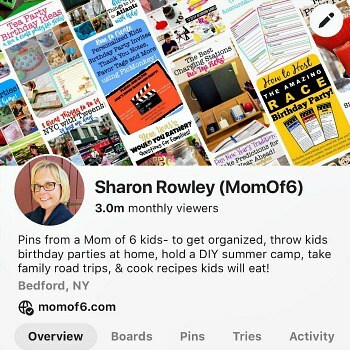 No, this isn't going to be the savings that I need to send my 6 kids to college…. but I would rather have it in my pocket that in the coffers of my electric company! So I installed all of my new lighting and have been working under these new lights for nearly two months now and I have to admit- I am happy with them. Yes- it still takes the bulbs a minute or so to “warm up” and achieve full-on strength- but I have decided that I am okay with that. The light is warmer and less harsh than the lights I had in these fixtures before- which is fine- even in my home-office situation. And once the lights have “warmed up”, I do feel that they are just as bright as the traditional lights I had been using. And I think that the light from my desk lamp works exactly the same as it had with the old bulb. So I am quite pleased with our little experiment- and ready to move ahead! While I am quite convinced that changing out all of the lightbulbs in our house over to CFL is the right thing to do, there is no doubt that it is an investment. So to minimize the heft of the the expense, and because I am far too frugal to simply throw away a perfectly good working incandescent bulb, we are embarking upon a plan to replace our regular light bulbs with CFL bulbs as they burn out. 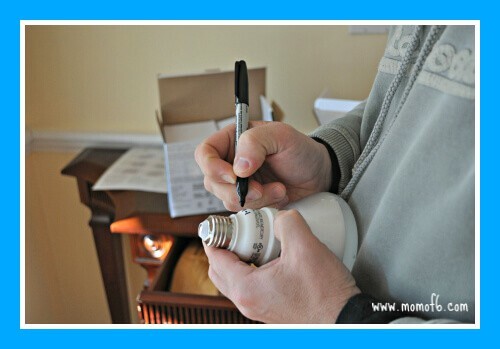 And Steve likes to write the “installation date” on the new CFL bulb with a Sharpie before putting it into the fixture- so later on we can marvel at how long they have lasted! Two rooms in our house are lit mainly by chandeliers- our kitchen and our dining room. So I would really like to start changing over the bulbs to CFLs as they burn out as well. 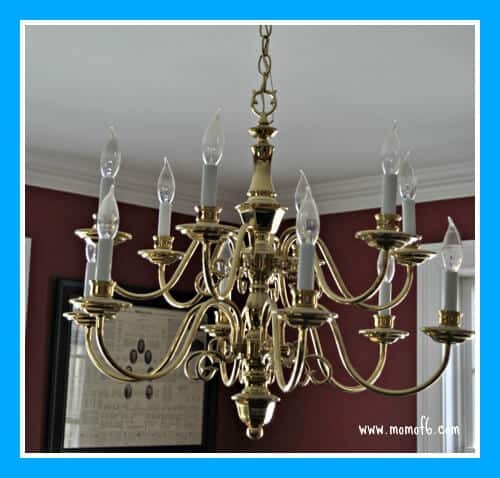 But first… I wanted to tackle the issue that these brass chandeliers really don't match the “color scheme” of the hardware we have throughout our house. Over the years we have changed out our kitchen fixtures, our drawers pulls and handles, and even our doorknobs to a brushed nickel finish. 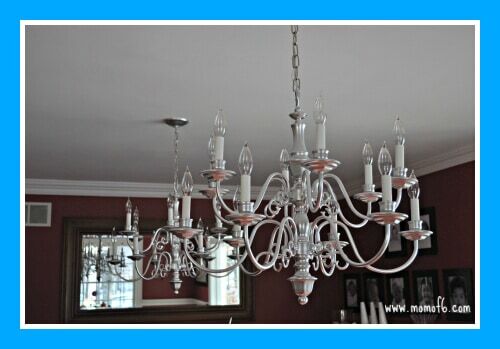 But these chandeliers were the last holdouts- and far too expensive to replace. Enter the handy-dandy can of spray paint! I asked my husband if we could try to just spray paint these to give them a new finish and he agreed to give it a try… testing the idea first on an old brass bathroom fixture first. And it was a success! I am in love with my new dining room chandeliers- and I can't believe that we waited so long to do this! 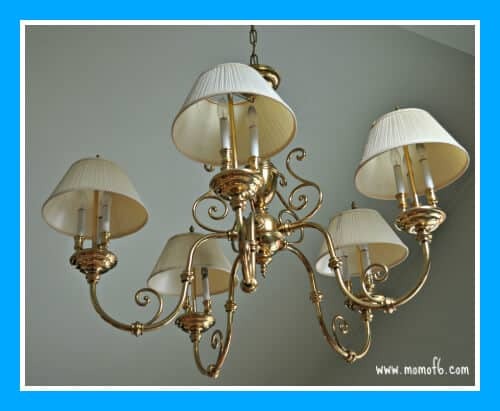 Next up: the kitchen chandelier…..
And changing out the chandelier bulbs to CFLs! 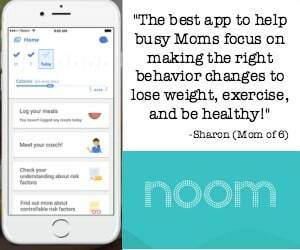 To stay up to date on the latest tips and ideas, please consider signing up to have Momof6 delivered daily to your email inbox! 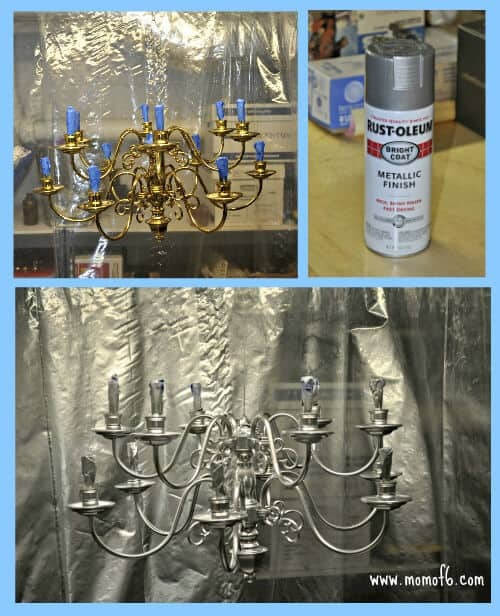 Wow….I want to go buy cans and cans of that spray paint and do my light fixtures and all my hardware too! Ha ha! I then ind fo went on a spray painting binge…..(or maybe I should say that I made Steve go on one)…. I re-did our Christmas tree star topper, a display tree that holds our glass-blown ornaments, and a few other small odds and ends- all from gold colored to polished nickel! It’s a bit addictive! 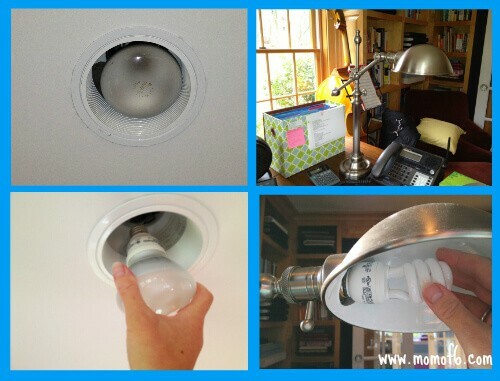 We’ve found the same – the CFLs don’t last anywhere close to what they should given their cost and supposed efficiency. I love that you wrote the install date on them, I’ll do that next time too. And I LOVE that you spray painted the chandeliers, they look amazing! We are brass over here too and I’m hoping to make the switch to a different finish slowly over time as well. It’s good to know spray paint is an option for some pieces. We’ve been making that change-over slowly for years….. but I kept holding off on the light fixtures because they were so expensive….. I was blown away with what we were able to do with an inexpensive can of spray paint! We have replaced most of our bulbs with CFLs but find that they don’t last as near as long as they are suppose to. Some of ours have blown out within the first 6 months to 1 year of installing them. I’ll be interested to see how long yours last. That is such a good idea to write the date of installation on the bulb. We will have to do that from now to keep track of it. You know, this is the first time that I have heard someone say that they don’t last as long as they should. We have some that we replaced in our home a few years ago and they are still going strong… but I will say that other CFL bulbs we have taken out and replaced because they just were annoying- they buzzed loudly or they flickered, or they took forever to warm up. It will be interesting to see once we eventually need to replace these new ones exactly how long they actually lasted! Thanks for giving me the heads-up on this!